A kidney biopsy is the removal of a small piece of kidney tissue or cells. The tissue or cells are checked in a lab. 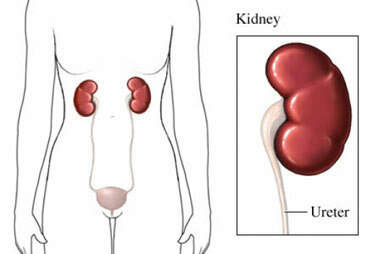 Kidney biopsies can help diagnose health conditions. A treatment plan can be made once the cause of the problems is determined. A biopsy can tell how well the new kidney is working if you had a transplant . Smoking may make the chances of having these problems higher. Talk to your doctor about your medicines. You may be asked to stop taking them up to 1 week in advance. A local anesthetic will be placed neart the biopsy site. The kidney will be found using an ultrasound or x-ray. Long needles will be inserted to collect tissue samples. A special instrument may be used to insert the needles. You may be asked to hold your breath. After the samples are collected, a bandage will be placed on your skin. The local anesthetic will block the pain during the biopsy. Medicines will ease any pain afterwards. You'll be watched for a few hours. You will be asked to remain lying down to lower the chance of bleeding. Your pulse and blood pressure will be checked. You will be sent home when you are feeling well and the doctor feels that it's safe. You may have to avoid lifting or exercise until the area is healed. Clean the incision site as advised to avoid infection. Heilbrun ME, Remer EM, Casalino DD, et al. ACR Appropriateness Criteria indeterminate renal mass. J Am Coll Radiol. 2015;12(4):333-341. Kidney biopsy. National Institute of Diabetes and Digestive and Kidney Diseases website. Available at: https://www.niddk.nih.gov/health-information/diagnostic-tests/kidney-biopsy. Updated November 2015. Accessed August 10, 2018. Tests for kidney cancer. American Cancer Society website. Available at: https://www.cancer.org/cancer/kidney-cancer/detection-diagnosis-staging/how-diagnosed.html. Updated August 1, 2017. Accessed August 10, 2018.